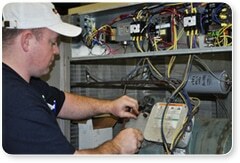 Boiler Repair is our prime focus at Alpha Mechanical Services. Our professional field technicians are available 24/7. They have a combined history of around thousand years. We can therefore meet the requirements of even the most complicated of boiler systems. We can repair or rebuild in less time than it takes to receive a factory replacement. With easy access to our critical parts inventory our boiler repair field experts can quickly repair issues. Repair issues ranging from small refractory fixes to urgent generator tube-bank replacements. This makes us one of the leading boiler repair companies in Louisville. But we don’t just cover the Louisville, KY area. Alpha Mechanical Service also covers Lexington and the rest of the state of Kentucky as well as surrounding areas such as Ohio, and Tennessee. At Alpha Energy Solutions we fully understand what down time and loss of production means to our Commercial clients. As a result we approach each repair project with the highest sense of urgency. All of our on-call boiler repair experts are available 24/7. Boiler experts can be on-site within just a few hours of your initial phone call to start repairs. We also service as mobile boiler parts department using our Alpha Energy Service Trucks. These trucks usually include everything you’ll ever need to get your boiler operational as fast as possible. If we anticipate your boiler being down for an extended amount of time we can arrange for a rental.